PokerStars Major Sunday Tournaments will have their buy-ins reduced by 50% but will still have the same guaranteed prize pools. Players can buy-in for half price to several Sunday PokerStars tournaments on the 17 June 2012. PokerStars host some of the largest guaranteed poker tournaments, here's your chance to play for millions with 50% off the regular buy-in. 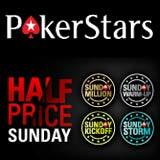 Play the Pokerstars Sunday Million, Sunday Warm-Up or the Sunday Storm, satellite tournaments are also available. The Pokerstars MicroMillions II is scheduled to take place 12 -21 July 2012, the micro stakes poker tournament series also offers guaranteed tournaments with low buy-ins. 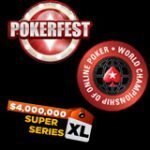 Get your seat to biggest Pokerstars tournaments and win your share of huge guaranteed prize pools for Half Price buy-ins. That's right for one day only Pokerstars will be reducing the buy-ins by 50% on selected Sunday Major tournaments, the guaranteed prize pools will still be the regular amount. 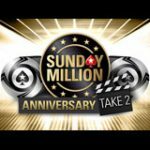 One of the best valued tournaments in the Pokerstars Half Price Sunday promotion would be the Pokerstars Sunday Storm, players can buy-in for a mere $5,50 and play a $300,000 guarantee poker tournament. You won't find buy-ins that low with large guaranteed tournaments at any other online poker site. The Pokerstars Half Price Sunday promotion takes place on Sunday, 17 June 2012. The following PokerStars Sunday tournaments have half price buy-ins, only on 17 June. Register for these Pokerstars tourneys in the lobby from the ‘Tourney’ & ‘Special’ tabs. Satellite tournaments for these events can also be located on each tournament registration page. Depositing players get a 100% first deposit bonus up to $600. Use PokerStars bonus code 'STARS600' when making a first deposit on pokerstars.com. The Pokerstars MicroMillions II tournament series returns on 12 -21 July 2012, micro stakes poker players can buy-in from $0.11 up to $22 for a series of guaranteed poker tournaments. Buy-in directly on the day or start playing for your seat in the daily satellite tournaments to win your seat for a fraction of the price. The Pokerstars Mobile App is now available for Android, iPhone and iPad, play the mobile version of Pokerstars on your mobile device. Games include: Ring Games, Tournaments, SNG as well as the popular Pokerstars Zoom Poker.